It is no secret that we are a society obsessed with technology. I read an alarming statistic recently that the average smartphone user touches his/her phone 2,617 times a day. Granted, the researchers who conducted the study counted every tap, swipe, and click individually, but still, those 2,617 touches added up to 145 minutes a day that the average person spends engaged and interacting with an electronic device. In fact, you are very likely reading this blog on a smartphone right now. If not, you are still reading it on some form of time-consuming technology. Perhaps it’s time for you to take a vacation from technology and travel off the grid. That’s exactly what we did, and the benefits lasted long after the trip was over. Technology can be great. It allows me to work remotely. 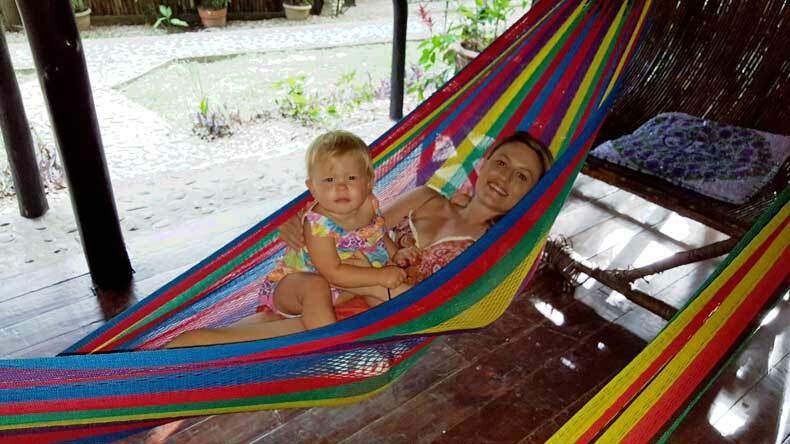 It allows me to maintain this blog which was originally started as a way for family and friends to follow our daughter’s adventures around the globe. Because of technology, we can stay connected with loved ones in different cities, states, and even countries. But technology can be addicting, and at least for me, it can consume hours of the day. For example, I spent at least one to two hours writing this blog. It took time to edit and add images and optimize it for search engines. I did this all with some small hope that you might spend 4 minutes of your day reading it. Although I do most of my writing or my work after my daughter, Avery, has gone to bed, I’ll admit there are plenty of times throughout the day that my attention is directed to my phone or my computer instead of to her. Working from home means that I am often replying to work emails during a client’s business hours. If I’m not doing that, I am handling social media for clients or for this travel blog, or engaging with readers and responding to comments. All of that takes a lot of time and energy, which is why I often feel extremely guilty that I’m not spending enough time with my daughter. I mean, that’s why I decided to work from home to begin with, right?! So that I could spend more time with my child? Any mother who works from home will likely understand that intense mom guilt. In fact, any mother who has a job period will understand that intense guilt. All of this brings me to the main point of this article. Every family should travel off the grid. Now, to be clear, I’m not talking about selling all of your worldly possessions, moving to the desert, living in a small hut made of mud, and growing your own vegetables. More power to you if that’s what you want to do. I like cable TV and WiFi too much to make that kind of permanent sacrifice. I’m talking about a temporary disconnect from technology so you can reconnect with what is truly important… your family. We did exactly this on our recent trip to Belize. The first few days, I booked us in a beautiful Eco-lodge in the jungle just outside of San Ignacio. Eco-lodges aren’t really that common in the United States, but they are fairly popular in Central America. They are sustainable, earth-friendly properties. We didn’t have television or WiFi in our rooms. There were no electrical outlets, so blow drying or curling my hair was out of the question. I discovered I actually spend quite a bit of time doing things like scrolling through Instagram or mindlessly watching television. No electricity? No WiFi? No problem! You know how I spent that extra time in Belize? I spent it loving my family. We hiked to waterfalls and caves and down to the river. 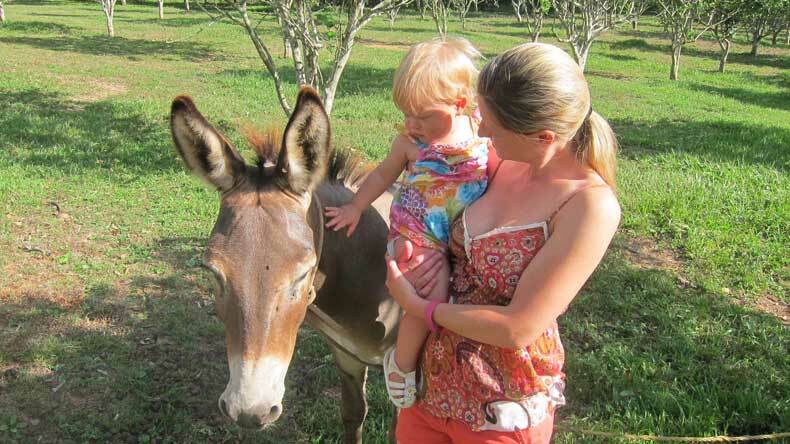 We laid around in hammocks and pet donkeys. Most importantly we talked to each other and listened to each other. We had meals together without distractions and spent all day outside until it was time for bed. We connected. We were blissfully unaware of everything going on back in The States. Do you know we went a week without hearing any political news?! (Hallelujah!). We were clueless as to the relationship statuses, lunch choices or major (and minor) life milestones of our friends on social media. What we were aware of though was each other. Sure, my hair looks awful in the few photos we took on that trip, and makeup would have definitely been my friend. But when I look back at those pictures, I don’t regret not having a way to do my hair. I don’t regret not spending time putting on makeup. And I definitely don’t regret leaving my phone in the room and disconnecting from technology. Looking back at those pictures, I think about the great time we had as a family. I think about the priceless memories we made together, the closer bond that we built, and the fun experiences we shared with our daughter. My advice is to take a vacation from technology. 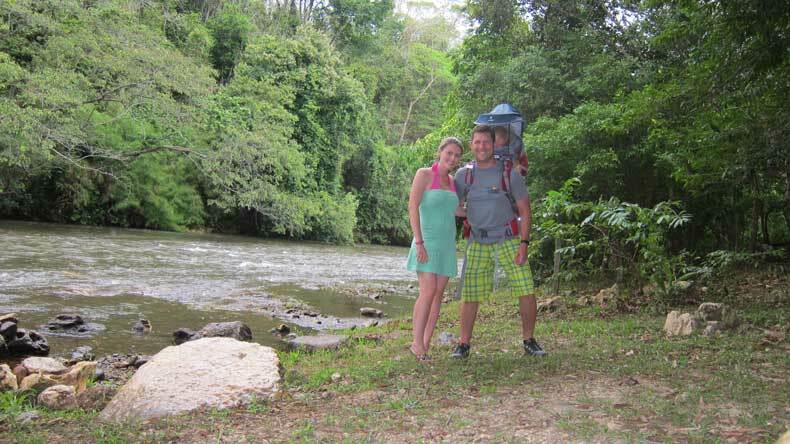 You don’t have to go to a remote jungle in Belize like we did. You don’t even have to leave your city or your home to travel off the grid. For one entire weekend, turn off your phone, unplug your computer and your television, and focus 100 percent of your attention on your family. Pray together, eat meals together at the table, take a walk, go for a hike or a bike ride. Spend time outdoors enjoying nature. Don’t respond to or even look at work emails or personal emails for that matter, leave the drama of social media behind, and for a few days just spend time with your loved ones. I realize that can be hard, that’s why we chose to go where technology wasn’t even an option. 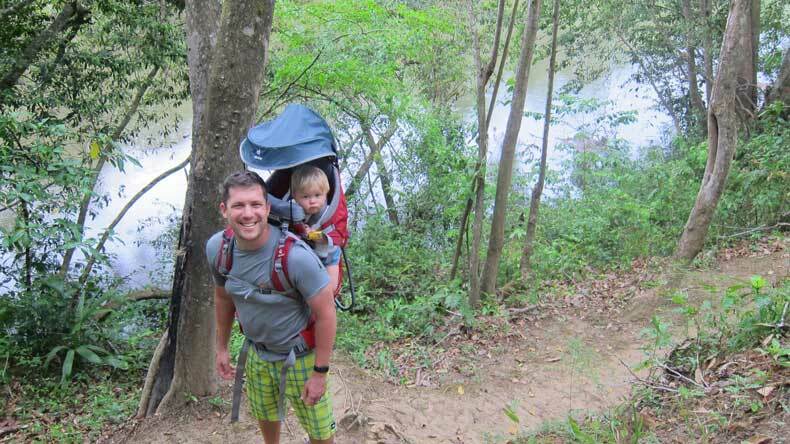 Traveling off the grid isn’t just something families should do. It’s a good idea for all travelers to remain unplugged on vacation, at least for a portion of their trip. Occasionally, we all need a break from technology to evaluate our priorities and make sure our lives and daily activities reflect those priorities. Since returning home from Belize, I’ve been more cognoscente of how much time I spend on the computer or on my phone. I make it a point to look at my husband when he talks, even if I am right in the middle of writing a text or an email. Now, I leave my phone in another room and read books to my toddler every day. And I set limits on the amount of time spent on social media. Overall, my family is my number one priority. I want that to be evident in how I choose to spend my time. It took having to travel off the the grid at a place where technology wasn’t available to realize it was consuming a big piece of real estate in my day. While I still admittedly spend a lot time on the computer or on my phone, I like to think my daily technology use has been downgraded to a small apartment instead of occupying the mansion I had let it overtake for so long. 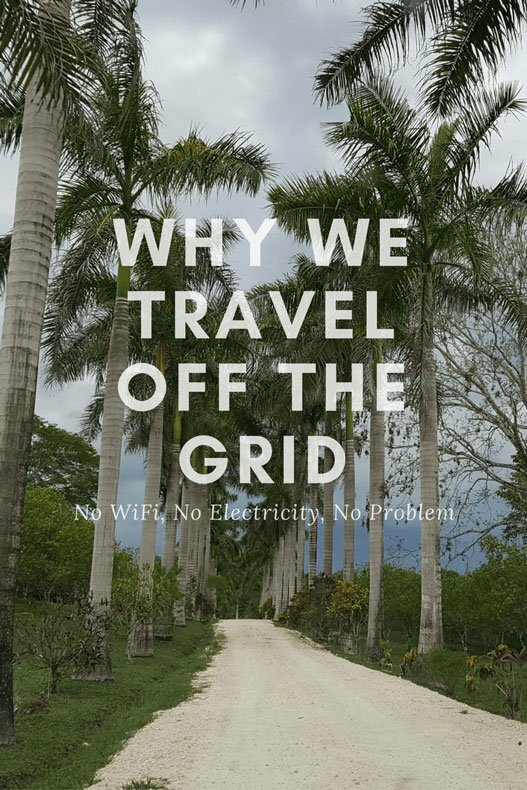 Do you ever travel off the grid and unplug on vacation? We’d love to hear your experience. Tell us about it in the comments below. Our phones not working is always a favorite part of vacationing outside the country! Well, not without wifi, and typically when in another country we’re too busy exploring to be confined to a place with wifi for long. We said “Man, it feels great not to be tied to our phones or worry about email” a million times while in Europe (and since that was pre-baby, we had no guilt or sense of I-need-to-check-in). Sure, we still had blow dryers and TV (although in French/Italian/Spanish, mostly), but the disconnection from our phones/social media was amazing. The same goes for disconnecting from cars. I drive approximately 2.5 hours (round trip) each day, and one of the best parts of traveling is not having to do that. We fell in love with trains and subways in Europe, and I miss it every day. I’d give anything to be able to commute using mass transit! We loved the rail service in Europe too! The US is extremely behind the times when it comes to mass transit. Despite our love for traveling by train in Europe, next month we are actually going to drive. It’s just easier with a toddler not to have to worry about her disturbing other passengers. The other advantage is that we can stop and explore some of the lesser visited areas along the way. Yeah, that makes complete sense. You’ll have to thank her later for allowing you to find some hidden gems! It is! It’s crazy how something designed to make life easier can actually make it more difficult. There is nothing more refreshing than going somewhere without your phone I find, even if it is accidentally. Sometimes I look down and my phone is in my hand completely subconsciously which really freaks me out! This post is a great reminder that sometimes we need to stop scrolling mindlessly in the morning through instagram and actually take in what is around us. Really great read! I am the same way! Sometimes I don’t even realize I’m on my phone because it’s just habit. So it was refreshing to go somewhere that forced us to put our phones down and truly be in the moment.